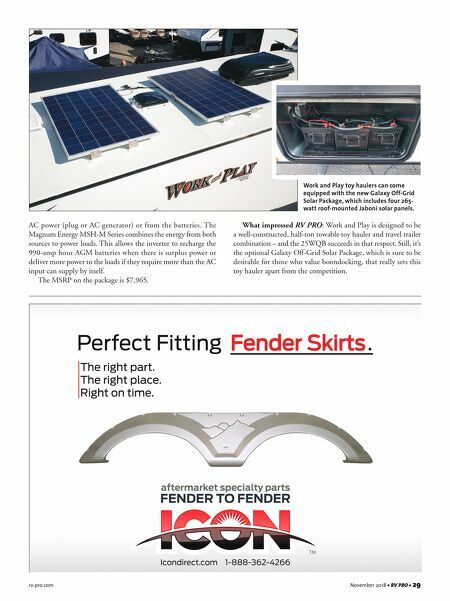 rv-pro.com November 2018 • RV PRO • 29 AC power (plug or AC generator) or from the batteries. The Magnum Energy MSH-M Series combines the energy from both sources to power loads. This allows the inverter to recharge the 990-amp hour AGM batteries when there is surplus power or deliver more power to the loads if they require more than the AC input can supply by itself. The MSRP on the package is $7,965. 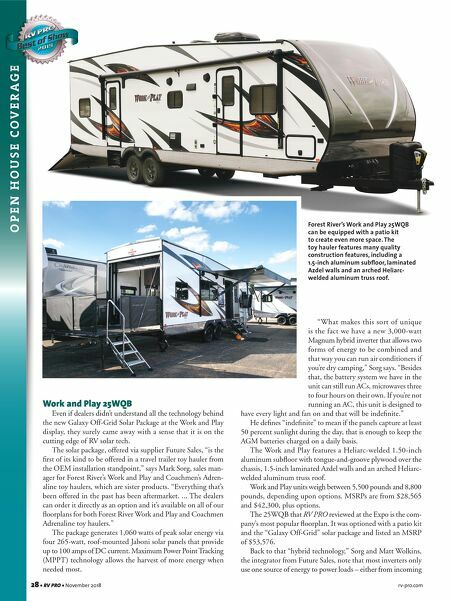 What impressed RV PRO: Work and Play is designed to be a well-constructed, half-ton towable toy hauler and travel trailer combination – and the 25WQB succeeds in that respect. Still, it's the optional Galaxy Off-Grid Solar Package, which is sure to be desirable for those who value boondocking, that really sets this toy hauler apart from the competition. Work and Play toy haulers can come equipped with the new Galaxy Off-Grid Solar Package, which includes four 265- watt roof-mounted Jaboni solar panels.